This homemade copycat of The Fish House’s famous Grits a Ya Ya is AMAZING and always receives rave reviews from family and friends. Try it today! For someone that’s hopelessly forgetful, I have a tendency to hold on to the most random of memories. One that always cracks me up involves walking in on Paul laser-focused on a wedge of gouda, meticulously slicing paper-thin slices of cheese and popping them in his mouth. It honestly doesn’t get any cheesier than that. His dorkery had me giggling as I was tinkering with this restaurant copycat. The Fish House in Pensacola, Florida is positively famous for their decadent Grits a Ya Ya. 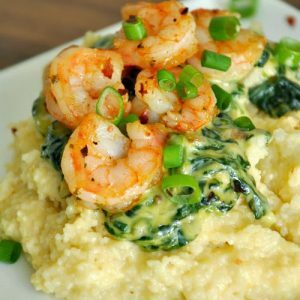 It pairs perfectly seasoned shrimp with a creamy spinach sauce atop a fluffy, cheesy mountain of grits. Gouda grits. It’s a magical experience. Let’s take that magic to the kitchen! 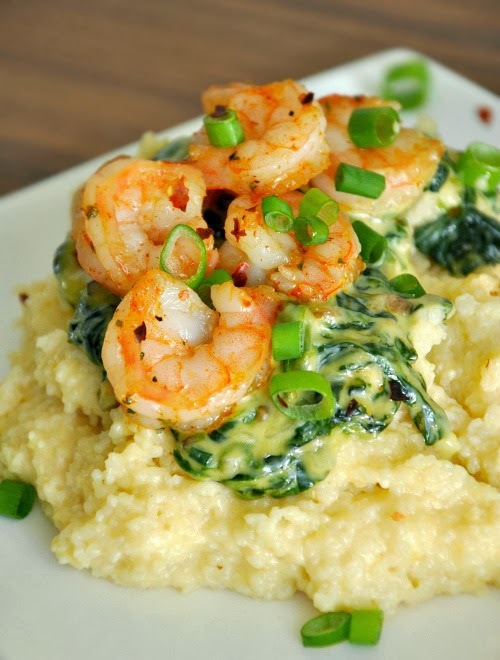 Ultra-fluffy gouda grits topped with a creamy spinach sauce and perfectly seasoned shrimp! Recipe adapted from Chef Jim Shirley of The Fishhouse in Pensacola Florida. As a quick note before you start: having everything prepped and ready to toss together ahead of time will save time. You can also multitask by starting the grits first and, while they cook, whip up the sauce and shrimp. This way they'll all be done around the same time so you can plate it all up and dig in! First bring vegetable broth to a boil in medium-sized pot. Reduce heat to lowest setting and simmer for 30-40 minutes, stirring occasionally. When the grits start to soak up the broth, add in the evaporated milk and stir. Once their time is just about up, fold in the butter and heavy cream. Lastly add the grated gouda and stir thoroughly until smooth and creamy. While the grits are simmering away, bring a large non-stick pan to medium heat and saute the white/yellow onion and garlic in a teeny drizzle of your favorite healthy oil, taking care not to burn the garlic. Once tender, add in butter, mushrooms, and shrimp and saute until the shrimp are just barely opaque before scooping out the shrimp and setting them aside. This way when you add the shrimp back to the pan they can continue cooking without overcooking. You can also choose to simply saute the shrimp at the very end, if desired! After removing the shrimp, add spinach, green onion, milk, and heavy cream and allow it to simmer while you stir to reduce the sauce. Once it reaches desired thickness, season with a pinch of salt and pepper and a dash of hot sauce, to taste. Pour sauce into a bowl and add a drizzle of oil to your now-empty pan. Turn up the heat and finish cooking the shrimp, seasoning it with garlic powder, cayenne, parsley and salt, if desired. Ready to eat? Spoon the sauce and shrimp onto heaping mounds of the cheese grits and top with chopped green onion and a pinch of red pepper flakes. Make token "MMMmmMMmm!" sounds as you shove heaping spoonfuls into your face. I typically use a mix of heavy cream and evaporated milk to make an ultra thick half-and-half to use as the cream bases for the sauce and grits. brontosaurus chefs feel free to add grilled or sauteed portobello mushroom slices in place of the shrimp or simply whip up a heaping pile of the gouda grits as a side dish! t-rex chefs feel free to use chicken broth and add in some crispy crumbled applewood smoked bacon to the mix – the original has both and it’s simply divine! For the dairy in the grits, feel free to sub half and half or make your own using a combination of cream and milk. You can even use all cream for richer results or plain milk for a lighter recipe. I used fresh gouda but if you’re a sucker for smoky flavor, grab a wedge of smoked gouda and get grating! Some of my grit-lovin’ readers mentioned they’re used to saucier/runnier grits and by all means, if you know exactly how you like your grits, feel free to add more broth and/or dairy to make them less fluffy and more creamy. The recipe is forgiving and flexible and pretty fantastic both ways! I actually make this one a lot so sometimes I keep them uber thick and fluffy [almost like mashed potatoes, yum!] and other times I’ll add more liquid and get saucy! Holy cheese grits, batman! I actually had to walk away from the pot because I nearly downed half of it while standing and stirring. If you’ve never had cheese grits before (they’re a staple here in the South! ), these taste sort of like a hearty whipped macaroni and cheese or cheesy mashed potatoes. It’s delightful and indulgent and.. oh look! Veggies! There’s green on the plate so it must be good for you, right? The finished product was as fabulous and plate-licking good as the original! It was also super filling. File this baby under flavorful, stick-to-your-ribs comfort food! I can’t stop making this delicious dish! Could you double this recipe? I would like to try this with Palmetto grits suggested by some reviewers. Which type should I buy? Yellow white or mixed? Can’t wait to try this! 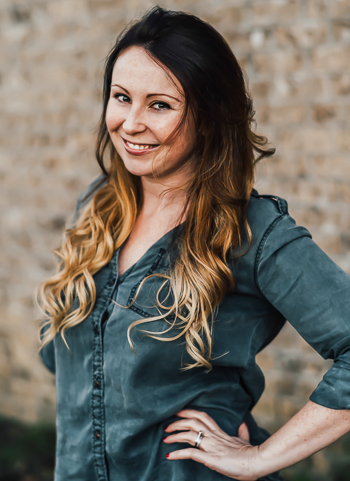 Love your blog Jenn, read you faithfully! Thank you for your excellent work! Hey Jeannette! I’m actually going to order some as well b/c I keep hearing how amazing their grits are! White work best for this recipe. I eat at his restaurants, Great Southern Cafe and The Bay, here in Santa Rosa Beach/30A quite often. His Grits a YaYa and Faux YaYa (at The Bay served on grilled fontina polenta cakes vs grits) are both delicious. I made your recipe for a friend the other night and we both raved about it! Thanks for sharing! If there is a chef to adore who is also extremely generous, Chef Jim Shirley is certainly one of them. He and his staff even make the Thanksgiving feast for our elementary school. Of course, the grits are always DELICIOUS! I lived right outside of Pensacola for 2 years and The Fish House was mine and my husbands go to spot, specifically for the grits a ya ya. When we left earlier this year I was so devastated that I would be able to have this meal on demand. I tried this recipe today and it is so close to the original that I have been bragging on it all day. If only you had the recipe to their key lime pie we would be back in business!! Thanks for posting such a great alternative to a much missed meal. Smallest world ever! So happy you loved the recipe (we make it like, so often it’s kind of obscene lol) and loved reading this! OMG and my FIL makes the most bomb key lime pie, I need to blog it for sure! It’s super close to Fish House just a wee bit tarter b/c we’re lime fanatics! Oh my goodness! I was just in Pensacola and had the best shrimp ‘n grits of my life. Yup, The Fish House’s Grits a ya ya. I’ve been wanting the recipe, and now, thanks to you, I have it! I’m a northerner with a southerner’s heart (mom was a southern belle). I have cheesy grits almost every morning for breakfast (Palmetto is my favorite brand and now Amazon ships me a bag on a regular basis!). Thank you so much for this recipe! 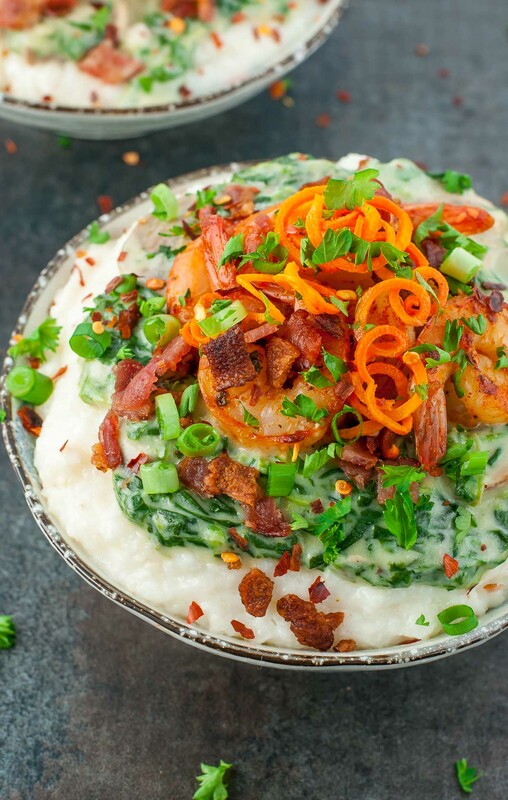 The only question I have is what is the orange curlicue on top of the grits? I loved them at the Fish House, but couldn’t quite place the taste. Hey Laurie! I hope this recipe rocks your socks! We make it super often even though we moved back to Pcola and I have access to the original, it’s just so great to whip up at home! The orange garnish is super-thin curly-fry-esque strips of either deep fried carrot or sweet potato (they’re so thin an crispy I can’t tell what they are – haha!) — I’ve used my spiralizer to slice super thin curls of carrot and top it on my grits sometimes but since it’s an extra step I usually just serve it up without them. Thanks Jenn! I couldn’t tell either if they were carrot or sweet potato. I’d leave them off, too. i can’t wait to try this recipe next week! Yes, the grits I order are Palmetto, out of South Carolina, of course. Enjoy! The Fish House in Pensacola is one of my all time favorite restaurants. I agree their Grits a Ya-Ya is possibly one of the best renditions of shrimp and grits ever. I fell in love with this dish – and many others they serve on a seasonal basis – when I was stationed in Pensacola when I was in the Navy back in 2002. I missed this dish when I came back home so I wrote to them years ago and got their actual recipe (which was also posted in their local paper a long time ago). They were so kind to share their recipe. I follow it almost to a T and it turns out fantastic. I am very bad though and use heavy cream in the shrimp mixture to make it creamier. Which I love. And I add lots of cayenne pepper to the shrimp when they are cooking in the bacon drippings to make it spicier than the original but far more to my liking. I reserve the hot sauce for passing at the table for people to add the zing if they need it. Which in my family is a must. Your recipe is a good, albeit, lighter take on this dish. I do like my grits a little – smoother- so I use a little more broth and milk to make them extra creamy and I cook them very low and slow for a longer time. Either way this is the very best comfort food from the south. I taste it and it takes me home to Pensacola. My southern home away from my Midwest home. Thank you for sharing! Did I miss a step? When does the 1/4 cup evaporated milk get added to the sauce prep? I see the !/4 cup evap milk for the grits. Thanks! It was delicious – will make again. Great recipe – just like the “real thing” from Fish House. Delicious! I love anything with grits, this looks fabulous. I live in Pensacola, and have had the Fish House’s Grits A YaYa many times. This recipe is very close to the original (with the bacon & chicken broth), and for that I my stomach thanks you! As far as the liquid to grits ratio, the original dish is very thick, and may not be the consistency most folks are used to when compared to other shrimp & grits recipes. It is different, but oh so yummy! Thanks so much Kerri!!!!! I’m so glad it was a hit with a true Pensacolan haha =) They’re certainly the thickest, fluffiest grits I’ve ever had but ohmygoooosh that’s what won me over in the first place! Hopefully it wins over a few soupy grits lovers too! Thanks for the sweet comment! I second what Kim said. Old-fashioned (stoneground) grits usually call for a lot more liquid per cup of grits than this ratio. Did you use stoneground grits or 5-minute grits for the 1:2 ratio? I had the same issue with the grits. 2 cups of broth to one cup of grits didn’t seem enough. And I looked at the directions on the box of grits and it says 5 cups of water for 1 cup of grits. I just cooked the grits according to package instructions and added the cream and cheese later. I also used Quaker old fashioned grits. Ahhhh foiled again by traditional grits! Haha these are meant to be thick and fluffly like mashed potatoes [a trick I learned from the restaurant these were inspired by!] but the extra broth is a-ok if you want them traditional-style! =) I’m not a southerner by nature so I make mine uber fluffy, hence the reduction in broth. So glad you enjoyed the recipe! Hey Kim! I’ve made it a few times and have only used 2 cups each time. The mixture gets pretty dry and fluffy as the grits absorb all the moisture and the milk, butter, and cheese all help moisten it up a bit once they’re added. For the most part, they’re thicker/fluffier than the typical restaurant pot-o-grits which tend to be a bit more runny! If you like them with more broth feel free to add a little more to taste! Doesnt this call for 4 cups of broth to make the grits? 2 cups was not enough liquid for me. Ooooh… what’s the UK equivalent? This looks YUM! Oh, honey. I can’t even handle this. I have to walk away from my screen right now before I do something inappropriate. I asked the Hubby to grab some more wood for the fire, and he predictably said I’ve got some wood right here for you. Men. Ha. I half expected that story about Paul to be another sleep-talking / sleep-walking / sleep-eating (?) episode. Shrimp and grits is like one of my favorite meals every … and this. Woah. Must try it. It looks so good!!!!! I have to confess.. I’ve never had grits!! I’m not opposed to them; I’ve just never went there. This definitely makes me want them though!! Holy cow I love grits!!!!! My momma is the only southern girl I know that doesn’t like them, but my grandmother overruled this and taught me proper things, like eating grits. And this looks wonderful. It’s a must-try! !